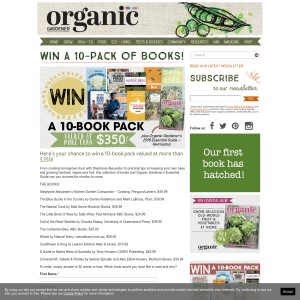 Here's your chance to win a 10-book pack valued at more than $350! From cooking homegrown food with Stephanie Alexander to practical tips on keeping your own bees and growing heirloom vegies and fruit, this collection of books and Organic Gardener’s Essential Guide has you covered for months to come. To enter, simply answer in 30 words or less: Which book would you most like to read and why? 22 October 2018 at the promoter’s premises. Full T&Cs are available at organicgardener. com.au. Delivery included in the giveaway. Remote areas can incur extra charges.